Wow.. keep experimenting, this is such a delicious looking treat! Thank you!!! So many things you could do with these pans…so little time…. do you think you could use regular cupcake pans for these? Yes! There are several people who commented about doing just that- you can read their tips by scrolling through the comments. Good luck! Pingback: The Friday Favorites. | Bake, Eat and Grow. Arrrgh, now I wish it were the middle of July SO BAD! I’m bookmarking these and saving ’em til then! I don’t know….I think I need my s’mores to be s’mores…there is just no dessert that can replace all that warm gooey happiness….even frosty ones in cups! I’m wishing for July as well…with all of my heart! smores in microwave…10 seconds and it’s like july! Hi! I wanted to let you know that I highlighted your recipe in one of my posts (via your link)! Looks amazing!!! 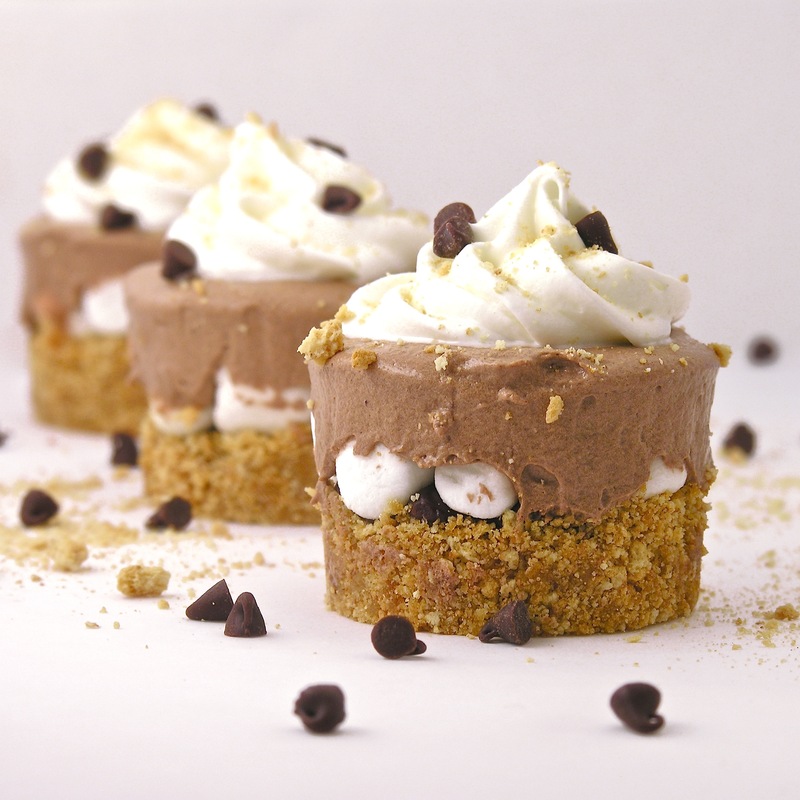 I’m planning on making your S’mores cups tonight for a party treat, and I’m just wondering how many this recipe makes. Thanks! This recipe makes 12 cups– but you’ll need some freezer time before you serve them….good luck! that pan would’ve been perfect for these mini apple pies i made awhile back. cant wait to make the frosty s’mores. happy spring! These look AMAZING. So does the mini cheesecake pan have a hole in the bottom of each cup? What kind of disks are you talking about? Are those to cover the holes while freezing and to make them easier to get out? Thanks! Yes, each cup has a hole in the bottom that you cover with a disk before putting your crust in (like the bottom of a springform pan). Then you pop the dessert out by pushing up on the disk through the bottom of the hole. There isn’t anything that comes with the pan to cover it in the freezer- you just need some Saran or foil wrap. Wonderful, thank you so much for the reply! I don’t have one of those pans! Do you think it would work in a regular muffing pan? If I dont have one of those pans can I use maybe silicone cups? You could try it…? My guess is that they would be hard to pop out?….but maybe not? Possibly tweaking the recipe to be made in a pan and cut into squares would work for you? What about using cupcake liners? I used a regular muffin tin and sprayed it with cooking spray and after freezing they popped out perfectly using a butter knife to go around the edges so really no need for the fancy pan. Just wondering how many cups of graham cracker crumbs do you think is in this recipe? I have to use different gluten free crackers. Hi Dawn! About 1 and 1/2 cups (once they are finely crushed). I LOVE gluten free grahams– I bet they will be so yummy with this recipe! Enjoy! Can you tell me where I go to find/buy one of these pans? I have never seen or heard of them before… and I really want to make these – they look wonderful!!!! Sure! If you look at the very 1st part of this recipe I talk about the Chicago Metallic Mini Cheesecake Pan. If you click on those words it will take you to Amazon- to the exact item (that is where I got mine). I also saw them at a specialty baking store in my city- but they were more expensive. I’d go the online route– Amazon or elsewhere 🙂 Good luck! I was just curious how do you think it would turn out if you made a pie out of it instead of individual cups? I think it would be super yummy! You could even buy a ready-made graham crust and save time! You might have to adjust amounts of everything else a little- or even make 2 pies. I’m not sure how far the fillings would go. If you try it please tell us!!! I just made this using a ready made graham crust and the measurements worked just fine….in the freezer as I type. Can’t wait to try it! Where did you buy your pan at? I plan to make these for camping night on the 26th! I just love the idea of this as a s’more replica since we are not allowed to have a fire where we are camping at! Thanks for the recipe! Now just to get the pan! or one similar to it! I featured this amazing recipe on my blog today! I am going to make this for my hubby tomorrow. Thank you for the inspiration!!!! Thank you again Ruthanne for the inspiration. Somehow BOTH of your comments slid under my radar– just saw them– I’m so glad you posted your version with muffin cups- lots of people are wondering if that would work….and now we know! Adorable family and fun blog!!! 🙂 Blessings to you as well Janiene! Saw this and instantly ordered the mini cheesecake pan, can’t wait to try this recipe and any others for the pan. Yes— I think that would work great! You might need to adjust the amount of filling – or make 2 pies. If you try it let us know how it works for you! Have you used this with marshmallow fluff? I think it would be the same texture as the rest of it instead of the marshmallows. I havent tried fluff- I thought about it, but I was afraid it might be too sticky and make the cups difficult to pop out….? If you try it, let us know how it works! Beautiful idea and I’d like to use your recipe for my family reunion that I am hosting soon. One question: What are the “disks” that you put in the bottom of the pan? I’m assuming you are using a muffin pan? Did I miss something? This is the first time I have viewed you on Pinterest. Thanks for much for the lovely recipe !!! Hi- and welcome 🙂 Glad you found us! The pan I used is a Chicago metallic mini-cheesecake pan (you can click on the link in the recipe for more specifics). It comes with small disks that fit into the bottom of each cup to make removal easier. 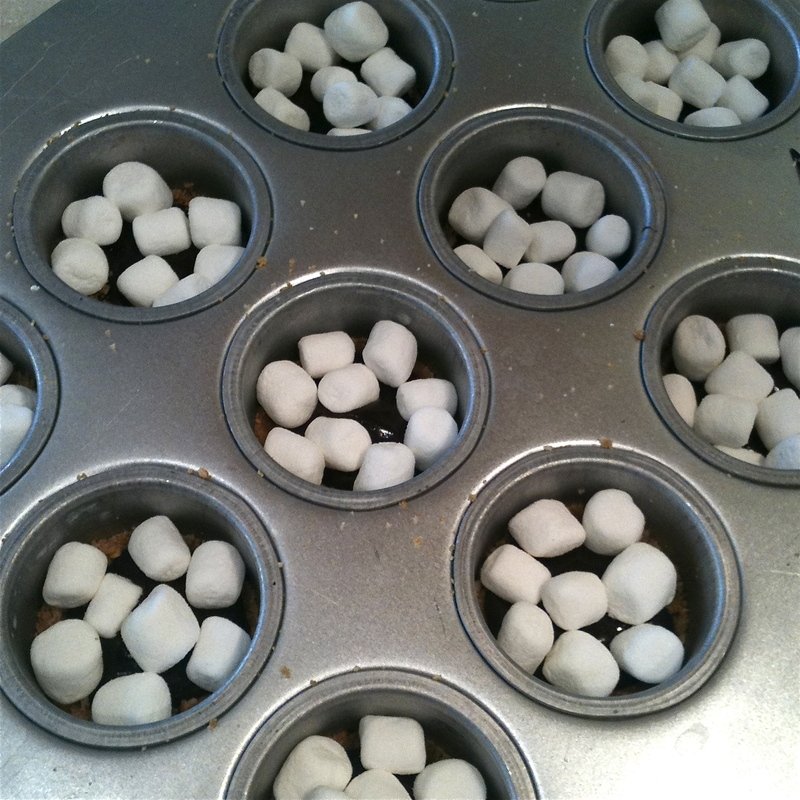 I made these and turned them into frozen s’mores cupcakes by just using muffin tins. It worked perfectly and they were fantastic. Yay! Lots of people have been asking about this– I’m so glad it worked for you and you shared your success with us! Thank you! i was just about to make some s’mores bars, and then i saw this… now i’m torn about which to make. perhaps both?!? Can’t wait to make these! They look awesome! I found this recipe on Pinterest and I made it using a store-bought graham cracker crust. I also used semi-sweet chocolate chips instead of milk chocolate. I think it will be a hit at our summer get-together. Thanks for the wonderful idea! It has so many possible variations! Oh I’m so glad you tried the graham cracker crust- lots of people have been wondering about that. Did you need to adjust the amounts of the filling ingredients? I wonder if marshmallow fluff would work just as well as the marshmallows. I have made these a few times and each time they are a TOTAL HIT! I do need to get one of those cool pans you have but the muffin cups have been working too. Thanks for linking my post! Your Frosty S’mores are so amazing!!! Thanks so much Shannon! I love that all of you are adapting this to make it what you want- and then sharing the process with everyone else. I bet it tasted wonderful as a pie! Can I place these in cupcake cups while baking? I do not have a pan like this. I haven’t made them in cupcake tins, but several people have commented here that they used cupcake papers and it worked great- another option is to get a premade graham cracker crust and make it as a pie. Good luck! These look so good.I have to give them a try soon! Thanks for a great recipe!! You are so welcome- I hope really enjoy them! This ones seem like a real treat but please…..could you think also about your readers from abroad?? graham cracker squares are not the same size around the world so could you please think about that next time and put a measure that can be used in any country? (“1 cup of graham crackers crumbs” would be a lot more helpful). Thanks for the reminder Claudia- I will add that info in! Excellant! I used cupcake papers since I did not thave the correct pan….what a treat! Hi Amy! Welcome!! Anyone who eats s’more leftovers for breakfast is a friend of mine! Thanks for sharing how your muffin tin version worked! Hi! Glad you found us! 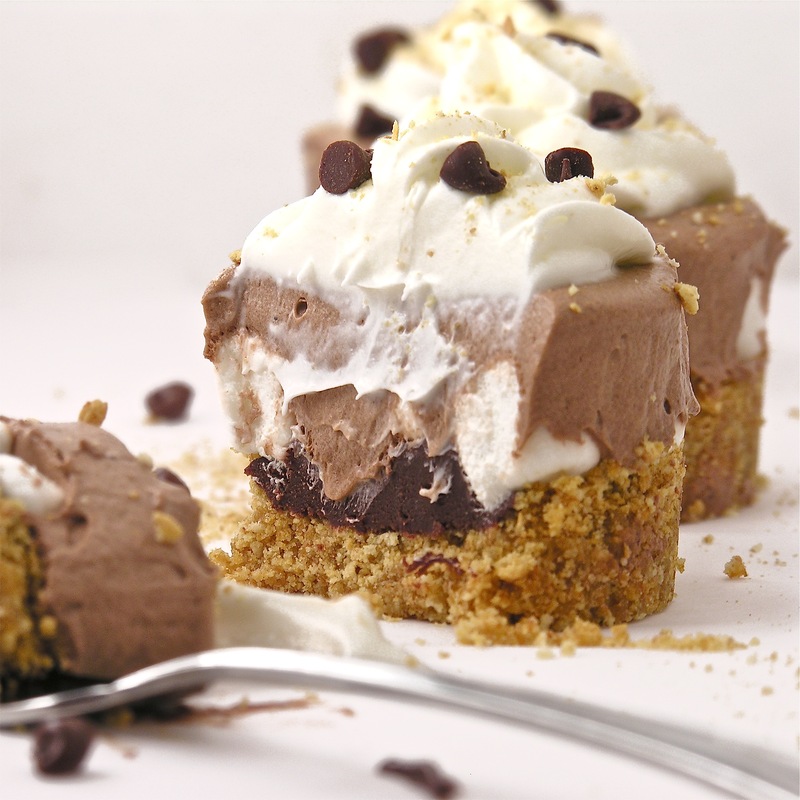 Here is one other recipe I created with the mini-cheesecake pans: Chocolate Chip Cookie Cheesecakes. More recipes are coming soon— I promise! Hi! I just love this recipe! These are going to be the first cupcakes I’ve ever done 🙂 What kind of whipping cream you used? Also, did you use instant pudding? Thanks! I’m planning on making these for Father’s Day…. Can’t wait!!!! I did use instant pudding and I use whatever brand of whipping cream the store has— usually WalMart brand actually. Good luck– I hope you make your dad’s day special! If I dot have the right pan to make these in can I put the dessert into muffin cups ?? Will it stick ? Several people have tried this and say that it works–or you could use cupcake liners to make sure. Good Luck!!! Hi Martha! 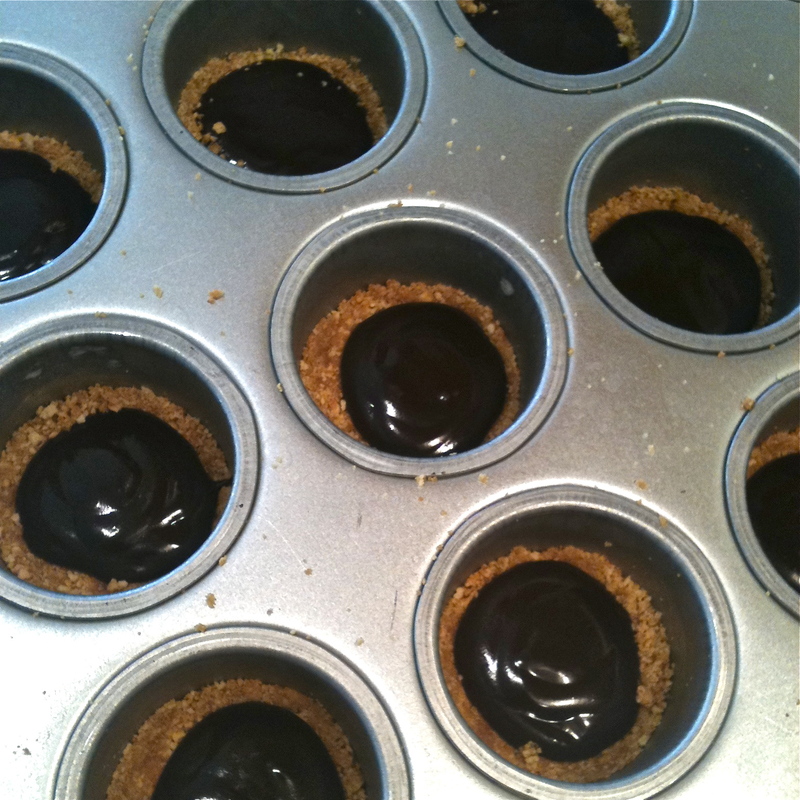 The disks come with the mini-cheesecake pan- they fit in the bottom of each cup and can be pushed up at the end. It makes them a little like a spring form pan with a removable bottom that way. If you want a link to Amazon to get the pan just click on the words “Chicago Metallic Spring Form Pan” in the recipe– or if you want to make them in muffin tins with cupcake liners that works too– then you don’t need to worry about disks at all! Enjoy! these were fun to make and tasted delicious, but the marshmallows froze making them very awkward to eat, with a fork anyway. next time i’d make some kind of a marshmallow sauce to top them with just before eating. Glad you liked them– I like them best a little thawed- but several people have tried marshmallow fluff with success, so maybe give that a try? Saw this and had to try them right away. I used a regular cupcake pan and they popped right out! I had to fight my kids for these…..I see lots of these in our future. I’m already planning on making another batch for July 4th celebration and plan on sprinkling some red, white, blue sprinkles on top! Thanks for sharing this awesome recipe! You are so welcome– I can’t stop making them either– the sprinkles will be so fun! Enjoy! I used cupcake liners which made them much easier to handle. EVERYONE who tried these loved them! This is one of the best Pinterest recipes I have tried yet. I’m so glad you enjoyed the recipe! Thanks for sharing!! Perfect! Well that is even easier than muffin cups– thanks for sharing your idea with us all!!! Thanks for the suggestions 🙂 Glad your family thought it was yummy– even though it was hard to eat! I haven’t made them in muffin tins, but several people have commented here that they used cupcake papers and it worked great- another option is to get a premade graham cracker crust and make it as a pie. Good luck! What disks are you referring too??? I am going to reblog it on my new reblog page! It is delicious! Thank you!!! Love your blog! Your blog is beautiful, the photo’s are amazing. So glad I found it. The Smore cups look so wonderful. Thank you so much– and welcome!!! Also thanks for subscribing – I hope you enjoy it! Thank you- yours is as well!! Spent done time drooling over it this morning! This looks so delicious! Made my mouth water! Wow!! Those are stunning and I bet taste amazing!! Youre my hero!! This looks so delicious! It. looks easy so easy to make. No one will believe I did it! Lol– those are the best desserts– the kind that shock people when you say you made them (especially when they are easy!) Good luck! What is the disk you put in the bottom of each cup ? The disks come with the mini cheesecake pan. The pan is like a muffin tin, but there’s a hole in the bottom of each cup. You put the disk in to cover the hole, make your dessert and then to remove the dessert you push up through the hole and it pushes the dessert out. The disk slides off the bottom of the crust and you just wash it with the pan. It’s pretty cool actually- I love mine! Just made these for Easter for the first time and they were wonderful! Very light and delicious. Did not take long to make and what a hit! I used a k-cup coffee pod to push the crusts down and worked fine. Will definitely be one of my go to desserts from now on. Would like more ideas to use the pans. I’m so glad you enjoyed them– the K-cup is a GREAT idea for pushing down the crusts! Way to be creative! There are several desserts that use this pan right here on easybaked. If you go to the photo gallery link you can see all of the recipes on the site. We have chocolate chip cheesecake, almond joy cups and pineapple upside down cakes that all use this pan. Hi, made these and they came out great. Only problem was that the center chocolate part was hard, is it supposed to be soft and creamy as well? They are a little harder when frozen solid. Let them warm up just a little bit before eating them- the chocolate layer should be like fudge. That is a GREAT idea! Sounds really yummy! Thanks for sharing with us!!! Thank you so much! Glad you found us!!! Thank you for sharing such a great recipe. I’ve been wanting to make this for a while now, seeing how tantalizing they look in the pictures. So I finally decided to make these for Thanksgiving and everyone loved them! They tasted even better than I expected, I don’t know how you came up with such a great concept but I can’t wait to try the other recipes now. I used a muffin tin with cupcake liners and it was easy to work with. Still debating if getting the cheesecake tin would be worth it, considering how little I bake. But I’d want to get it just for the sake of working with a new gadget :). I’m so glad you tried it!!! I love them too- one of my favorite go-to recipes! Plus they are so cute!! I really love my pan- but I bake a lot, so it gets a lot of use. It’s really fun though…? Thanks for stopping by to let me know how they worked out for you! Thank you- so glad you liked them! Do I mix the pudding mix with the milk or do I prepare the pudding first and then mix with the milk? Thanks! Oh goodness. I was out of town all day yesterday in meetings. Sorry!!! The milk is added to the pudding and mixed. Just that one addition of milk. I hope they turned out for you- these are one of my favorites! Habe you ever made these into bars? If so what size pan did you use?